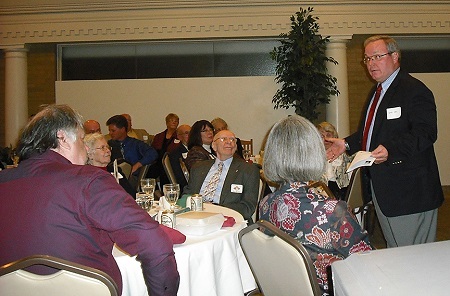 On November 9th The Lighter-Than-Air Society held its 61st Annual Banquet and Fundraiser. This year’s guest speaker was Dr. Michael Heil, President and CEO of the Ohio Aerospace Institute (OAI). A distinguished engineering graduate from the U.S. Air Force Academy, Class of 1975, Dr. Heil received a master’s degree in flight structures from Columbia University on a Guggenheim Fellowship in 1976 and a doctorate in aerospace engineering from the Air Force Institute of Technology in 1986. OAI’s mission is to enhance its partners’ aerospace competitiveness through research and technology development, workforce preparedness, and engagement with global networks for innovation and advocacy. OAI works closely with Ohio’s two aerospace related federal research laboratories (the Air Force Research Laboratory in Dayton and NASA Glenn Research Center in Cleveland); numerous aerospace related companies with operations in Ohio and Ohio universities with Ph.D. and research programs in aerospace-related fields. Dr. Michael Heil, President and CEO of the Ohio Aerospace Institute (OAI) addresses the guests at the 61st Annual Banquet of The Lighter-Than-Air Society. Dr. Heil spoke about the large number of industries and colleges in Ohio involved in aerospace as well as the many Ohio natives who have made contributions to the field and have attained noteworthy achievements. He also highlighted current projects of lighter-than-air vehicles for transportation and research. Ren Brown, for whom the P. Rendall Brown Lifetime Achievement Award is named, presents the award to this year’s honoree, Eric Brothers. This year, the P. Rendall Brown Lifetime Achievement Award was presented to Eric Brothers. 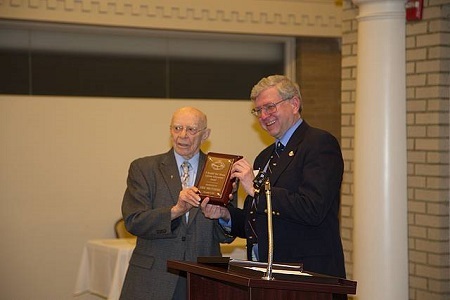 Eric was recognized for his contributions to the Society since 1986 and to Lighter-Than-Air in general as a respected historian in the field. He is the editor of Dr. Dale Topping’s When Giants Roamed the Sky. He has also published several historical articles about airships and served as consultant to several producers of historical programs about airships and buoyant flight. Since 1993, he has been editor of Buoyant Flight. Dave Wertz, Chairman of the Board of Trustees of The Lighter-Than-Air Society presents The Year in Review. Dave Wertz, Chairman of the Board of Trustees, reviewed the activities of the LTA Society during the past year, including a special commemoration program on occasion of the 80th anniversaries of the losses of the USS Akron and the J-3 blimp as well as the first flight of the USS Macon; the return of Buoyant Flight, the Society’s premier publication; and the receipt of several donations of significant historic items and a generous monetary gift. 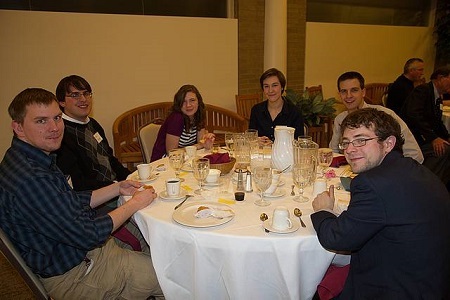 A group of students of the University of Akron’s College of Engineering attended the Banquet. As in the past few years, there were students and faculty members of the University of Akron’s College of Engineering present at the event. The silent auction once again yielded funds that will go toward operating expenses. Auction items included a guided tour of the Akron Airdock, several golf packages and a number of other LTA-related items. 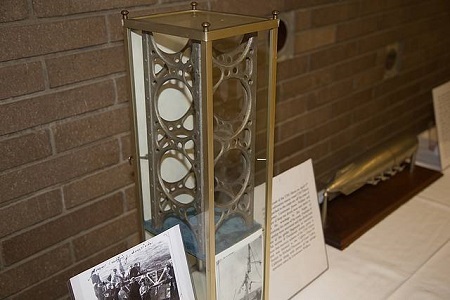 Several of the items from the collection of The Lighter-Than-Air Society were on display at the event. 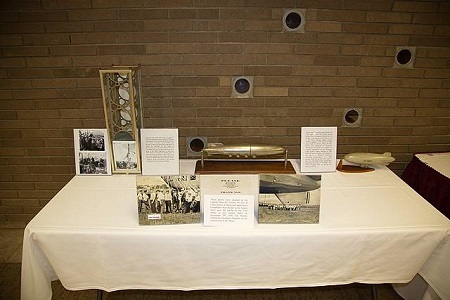 Included in the memorabilia display was a section of one of the girders salvaged from the USS Akron which was lost at sea in April of 1933. The girder was donated to The Lighter-Than-Air Society by Richard Plummer. The memorabilia displays included several personal collections of historic photographs as well as some artifacts received as donations throughout the year. 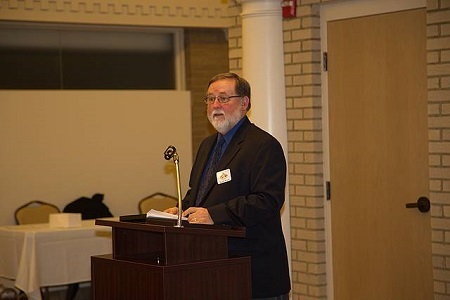 This entry was posted in Annual Banquet, Events and tagged Annual Banquet, OAI, Ohio Aerospace Institute, P. Rendall Brown Lifetime Achievement Award, Silent Auction, The Lighter-Than-Air Society. Bookmark the permalink.